New England, ca. 1750-1780. Cooper-made with pine staves, lid, and base, and what appears to be ash interlocking bands. UNTOUCHED original condition with completely dry surface and natural patina. 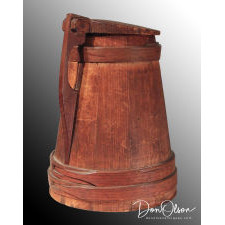 Clever construction without the use of nails, the handle being part of a narrow stave that is secured tightly in-place by beautifully crafted interlocking bands that were shrunk into position. The severely sloping and tapering lid (the deep angle consistent with the very early date) is joined to the handle by a wooden pin. 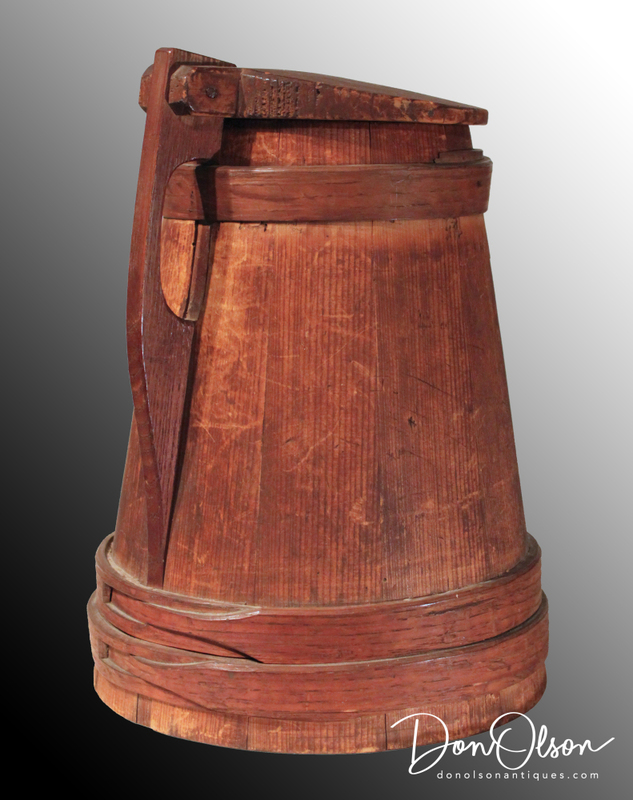 The enormous scale (about 11 inches tall x 8 diameter at the base) indicates use in a tavern as a sharing vessel rather than for individual drinking. The sidewalls are steeply sloped. The elegance and sophistication of the design combined with the superior craftsmanship are hallmarks of early period work. The condition can be best described as AWESOME! Reference: "Illustrated Encyclopedia of the American Revolution" by George Neumann and Frank Kravic. Provenance: Gifted in the 1950s by Nina Fletcher Little to her close friend Alice Andrews of Winchester, Massachusetts. A SUPERIOR EXAMPLE.